Gregory the Great (c.540-604) was pope (from 590 until his death), reputed inventor of 'Gregorian' chant, and one of the most important authors of the early Middle Ages. His Commentary on Job is a vast work, running to half a million words, divided into 35 books, and is bound in as many as six volumes. This manuscript contains Books 17-35, and was therefore presumably the second half of a two-volume set that was apparently owned in the Middle Ages by St. Mary's Priory, Bradenstoke (between Swindon and Chippenham). 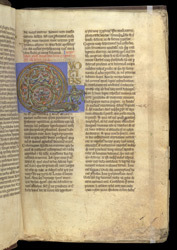 Following a general prologue, the text continues with Book XVII, introduced by a rubric and an unusually richly painted and gilded initial 'Q', incorporating foliate 'Byzantine blossoms' and with the tail of the letter formed of a dragon.